Some things transcend words capacity to do much for them. Actually, words can do little but interfere with tranquility. Maybe you had to be standing there in the cold drizzle that bordered on snow looking at this concrete woman draped in her stone hood to feel like I felt about her. 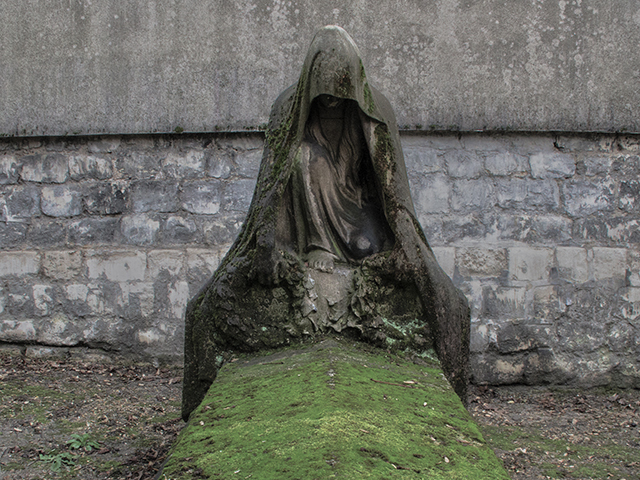 Perhaps you needed to see her sitting curled up atop the grave of …her lover? Her son? Her charge in case she was a guardian angel to share my awe about her. Maybe the fact that I had to crop the bottom part of the photo a little bit to make it fit into the confines of this space take that experience away for you. Maybe it was just me, standing there, that moment in time, under those skies, with that temperature, and the slight chill in my feet that lead me to feel that I can’t adequately improve upon it with my narrative. Whatever it is, suffice it say that I can’t improve on this one by over explaining it. Obviously it’s another grave at Pere Lachaise Cemetery in Paris, and obviously it’s a woman (maybe an angel?) sitting covered, barefoot, atop a grave, head bowed down with her gaze lowered to meet the spot where the deceased’s eyes would be. She had been lovingly carved out of stone that over time has found itself covered in moss to make the effect even more haunting. That cold stone sporting a layer of living bright green moss, the hope intrinsic in it as well…not sure how to finish this sentence. Going to stop writing on this one now. The uncertainty is a little too much for me. Maybe I should have stopped when I started? Maybe I’ll come back to it someday, maybe I won’t. Some times it’s all right not to know what to say and to admit it without shame. For now, Enjoy the Silence.